Your detailed personal Tarot consultation will help you focus on challenging life issues. Before you have a reading you may not be fully aware of which part of your life needs attention. After the reading you will have a more detailed focus on whatever issues you may have. Your path will become clear and you will begin to develop a personal plan to take steps to get you back on the right track. A well established method of achieving positive life changing results is guided meditation. As this essentially involves reprogramming your mind it is vital that you choose professional guidance from a respected source. Guided meditations are available in a variety of topics from, stress reduction, relaxation, pain management, self confidence and relationship guidance. You can try a free no obligation 20 min guided meditation by clicking on the following link. 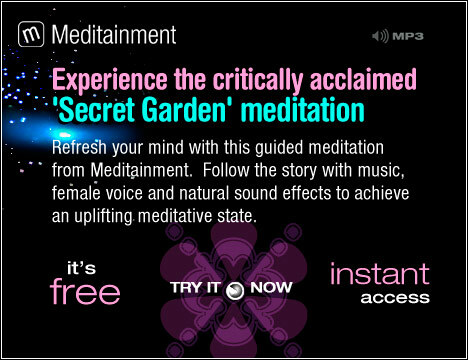 This professional guided meditation creates your very own secret garden where you relax in your hammock in the cool shade. You will come to experience calm and relaxation where you can contemplate any issue of your choosing with a crystal clear mind.